If someone were to peek into my bathroom, they’d probably think they are peeping onto a shampoo aisle of a drugstore or a departmental store. It’s jam-packed with products! One true confession: When it comes to personal care items, I am an addict. Every single inch of the usable surface area of my bathroom shelf is covered with myriad shampoos, shower gels, lotions, and conditioners from different brands. While, it serves as a great feast to my eyes, it’s a source of constant irritation to Manish, who believes in minimalism. I would say most skin types would be able to love and enjoy this body cleanser. But if you have particularly dry skin, you’d be rather better off with some rich heavy duty cream based body wash.
Aqua, sodium laureath sulfate, cocamidopropyl betaine, PEG-7 glyceryl cocoate, parfum, disodium cocoyl glutamate, helianthus annuus. 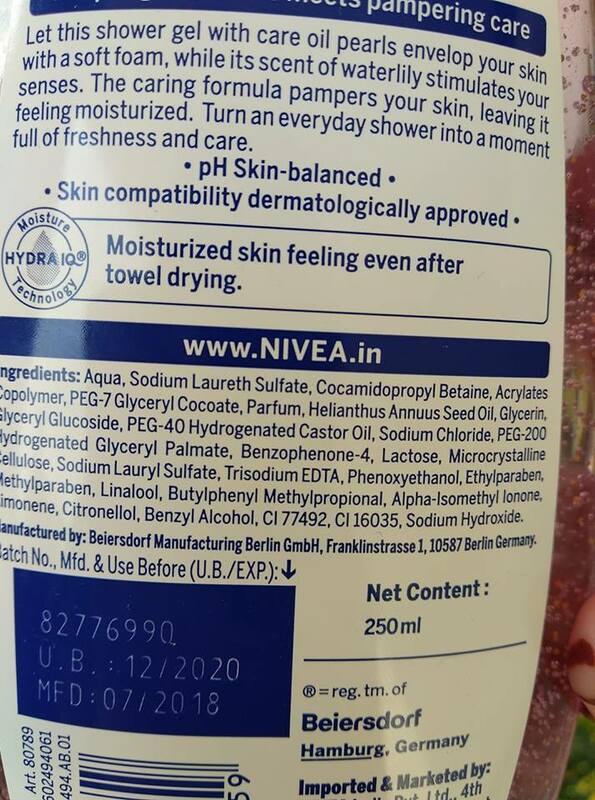 Possibly allergy/acne causing any ingredient? Comes in a transparent plastic bottle with flip open cap. The plastic bottle and flip open cap doesn’t make it quite travel-friendly. But it’s good enough to keep on the ledge in your shower and use. Take out a coin sized amount on my loofah and apply directly onto wet body skin. Massage in and build into luscious sudsy lather. Rinse off with warm/cool water depending on the season. Either. But best suited for summer, spring & fall months. I personally don’t recommend it for colder months. 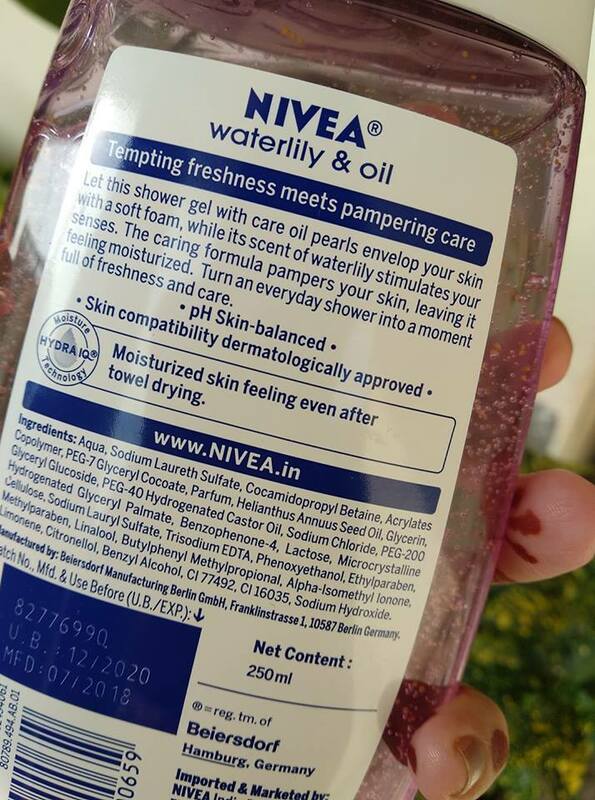 What’s good about Nivea Water Lily And Oil Shower Gel? I’m a fragrance person. 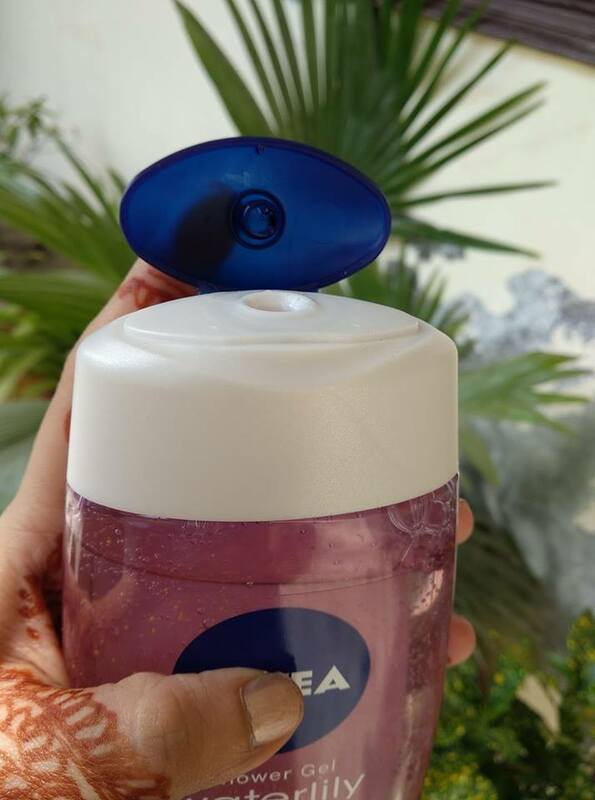 And this shower gel from Nivea smells and feels just amazing – like fresh Lilies immersed in a gorgeous gel. It suds easily and beautifully into a rich lather that effectively takes off all dirt, grease, and grime from the skin. 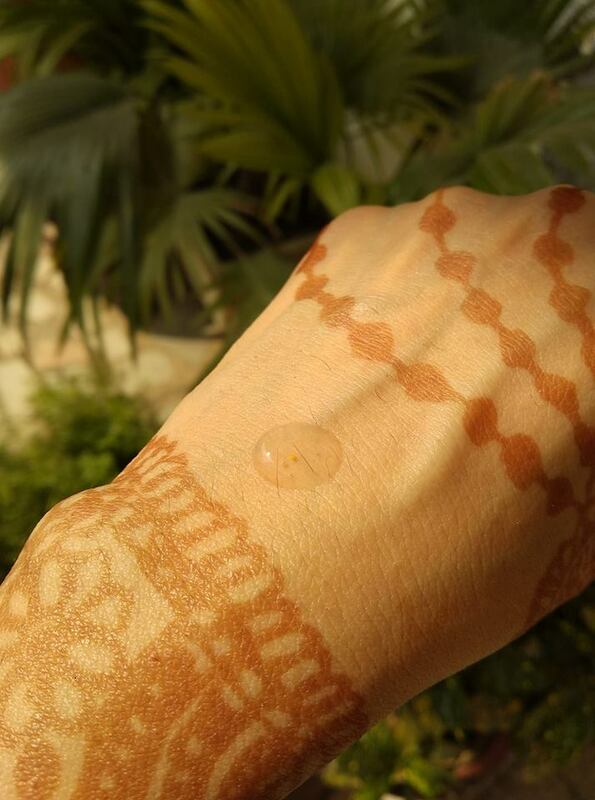 Also, it rinses off easily without drying the skin and without leaving any residue or film behind either. Skin is left smooth, shiny and squeaky clean. And for the price it comes, it’s a total bargain! Perform the same way if not better than most other fancy body washes in the market at a fraction of their cost. True, it doesn’t dry out your skin but it doesn’t even moisturize your skin after bath as claimed by its “Hydra IQ” technology. I do need to apply a body lotion after using this shower gel to make my skin feel really soft and moisturized after bath. In short, Nivea Water Lily And Oil Shower Gel is just like the way a decent shower gel should be. It smells nice, cleanses well, has a lovely texture and doesn’t dry out the skin. If you don’t want to splurge on a luxe body wash, add it your list – gives a similar feeling sans the hefty price.